Update: There is new .NET jsreport sdk available with breaking changes which deprecates using jsreport VS extension. Please follow the videos and example in the sdk documentation to get the up to date information. 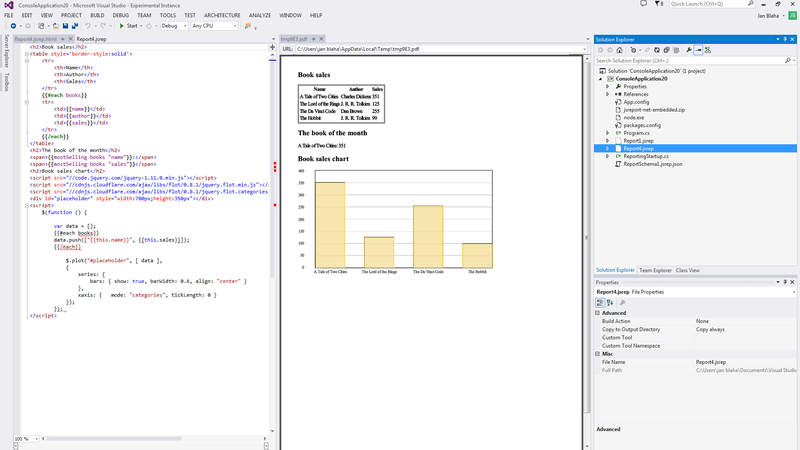 I am glad to announce we published first public version of jsreport visual studio tools extension allowing to design and render pdf reports from visual studio. This extension will give you similar experience as using jsreport html studio including creating or previewing report templates. Whole tutorial for working with visual studio is located in updated learn secion here. Visual studio extension should improve reporting experience for c# developers. Not only they can now design and prepare reports in visual studio. jsreport provides also package allowing to embed jsreport into .net without nodejs nor jsreport installation needed. Creating pdf reports from c# without an external dependency is then peace of cake. Check it out here. Next time we will also look for nodejs and java clients so the jsreport family is complete.